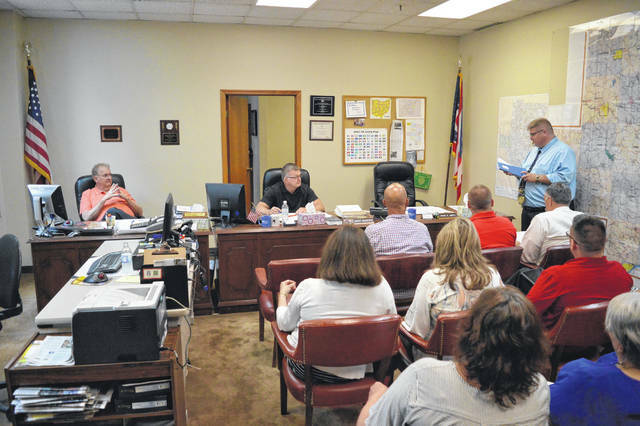 Gallia Children’s Services Director Russ Moore addresses Gallia Commissioners Thursday morning with public school officials to discuss the hopes of hiring a full-time case worker dedicated to meeting the needs of Gallia public school districts. GALLIPOLIS — Gallia public school district educators gathered with Gallia Children’s Services Director Russ Moore, Gallia Job and Family Services Director Dana Glassburn and Gallia Commissioners in the Gallia Courthouse Thursday morning to discuss the potential for hiring a full-time children’s services case worker to be dedicated to meeting public school system needs. Moore addressed the commissioners first, stating that educators and administration from both Gallipolis City Schools and Gallia County Local Schools, along with his office, felt it was necessary to create a full-time case worker position to serve as a liaison between the schools and Gallia Children’s Services. Moore said he received positive feedback from the schools and also some constructive criticism. For 2017, Gallia Children’s Services received 480 reports of child abuse or neglect. Around 24 percent of those reports originated from public schools. This did not include reports directly made to the Gallia County Sheriff’s Office. Through May 31 this year, the agency had received 188 reports and 39 of those were received from the school system. The estimated cost for hiring the new position for Gallia Children’s Services was priced around $53,800. Supporters of creating the new position stated they felt it would be an investment into child safety and problem prevention. Gallia Children’s Services Board member Phil Skidmore thanked the commissioners for their continued support. “We would really like to have this one person hired that would take and do everything for the schools because our kids are really important to us, as you know, and this is one way we think we can help out our child abuse and other problems going on in the county we might not be aware of,” said Skidmore. Vinton Elementary School Principal Leslie Henry delivered some statistics regarding children within her school. More than 70 percent of the students in Vinton Elementary come from “economically disadvantaged” homes, said Henry. She gathered data by class and then merged it into grade level with around 60 students per grade level. Vinton Elementary encompasses students from pre-kindergarten up to fifth grade. Around 38 percent of students in “one particular grade level” come from single family homes. In another grade level, 23 percent of students live with someone other than parents. In the same grade level, 23 percent of students had a parent or caregiver currently incarcerated or had been at a point in time. In another unspecified grade level, 13 percent of students had been subject to abuse, trauma or witness to either. In another grade level, seven percent of students live in homes with drug use. Gallipolis City Schools Superintendent Craig Wright said as community partners the assembled were not coming to demand from the commissioners, and if nothing more came from the conversation that he hoped it resulted in awareness and a stronger partnership to get to the results needed. Wright said he often thought of early interventions as being important to address problems and that he saw the addition of a case worker as doing that. Commissioner Harold Montgomery and Saunders said they were open to creative solutions in finding a way to fund such a position but it could be difficult because of further cuts to funding, like the loss of nearly $600,000 from Medicaid-managed care organization (MCO) sales tax due to state government decisions. If the county were to attempt to fund a new position, it would likely come at a cut to another department that was not mandated by law to be funded by the county. If so, that would likely be pulled from 4-H programming and Soil and Water District budgets. Commissioner David Smith was not present at the meeting. Commissioners said the Gallia general fund has around $8.6 million. No decisions were made during the meeting.